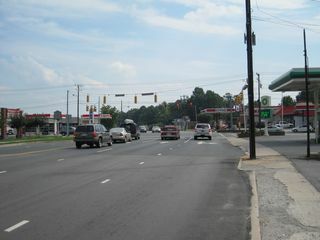 The Intersection of Innes Street and Mocksville Avenue. Notice that there are three gas stations at this intersection. You will come to it shortly after passing Catawba College. This intersection can be confusing because at this point Statesville Avenue becomes Mahaley Avenue. Click on the picture for a larger version.